Over 80 percent of all consumers research a service or product online before giving a company their business – and a majority of consumers now do their internet browsing through their smartphone. Businesses that have sites filled with Flash, pictures, and numerous tabs and pages aren’t easily accessible to smartphone web browsers, and will definitely see a lag in business as smartphone usage becomes more and more prominent. The harder you make it for a potential customer to find you online, the less likely they will give you their business. If it takes forever for your page to load, or doesn’t properly load on their browser, you can guarantee that they will hit the back button and move right along to your competitor – whose page does load easily on their smartphone browser. 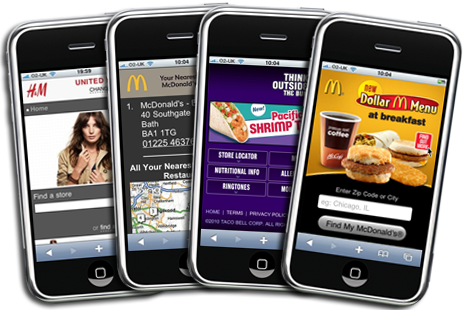 Mobile phone browsers automatically go to the center of a website when pulling it up. To make sure that the information you want your visitors to see first shows up, center your website. One of the biggest issues with sites being pulled up on smartphones are the various browsers that users have. There are a wide variety of browsers, and smart phones will sometimes discriminate on the type of code a website can have if it wishes to fully load. To make sure that your website pulls up regardless of the browser being used, make sure to separate content and presentation using CSS, and be sure to test your site after it is created. Don’t load down your site with Flash, or multiple tab options. You want your users to be able to get the information they want and need quickly, without having to scroll all over their phone screen. Remember, a smartphone’s owner only has a few inches to view a site from so make sure that your potential visitors can be captivated by those few inches.